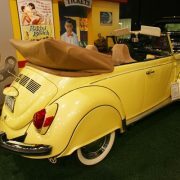 A 4-speed with air conditioning, beautiful restoration with a few custom upgrades like pearl yellow paint, fender skirts, radial wide whites, chrome VW wheels, stereo, upgraded interior and canvas soft top. The Volkswagen Type 1 is an economy car produced by the German auto maker Volkswagen (VW) from 1938 until 2003. 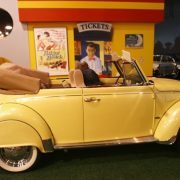 The car was originally known as Kafer, the German word for “beetle,” from which the popular English nickname originates. It was not until August 1967 that the Volkswagen corporation itself began using the name Beetle in marketing materials in the US. Starting in 1931, Ferdinand Porsche and Zundapp developed the “Auto fur Jedermann” (car for everyman). This was the first time the name “Volkswagen” was used. Porsche already preferred the flat-4 cylinder engine, but Zundapp used a watercooled 5-cylinder radial engine. In 1932, three prototypes were running. All of those cars were lost during the war, the last in a bombing raid over Stuttgart in 1945. 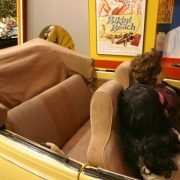 In 1933, Adolf Hitler gave the order to Ferdinand Porsche to develop a “Volks-Wagen” (the name means “people’s car” in German, in which it is pronounced (folksvagen), a basic vehicle that should be capable of transporting two adults and three children at a speed of 100 km/h (62 mph). The People’s Car would be made available to citizens of the Third Reich through a savings scheme at 990 Reichsmark, about the price of a small motorcycle at the time (an average income being around 32RM/week). Erwin Komenda, Porsche’s chief designer, was responsible for the design and styling of the car. Production only became financially viable, however, when it was backed by the Third Reich. War broke out before the large-scale production of the “People’s Car” could commence, and manufacturing capacity was shifted to producing military vehicles. Production of civilian VW automobiles did not start until after the post-war occupation began. Initially called the Porsche 60 by Ferdinand Porsche, it was officially named the KdF-Wagen when the project was launched. The name refers to Kraft durch Freude (Strength Through Joy), the official leisure organization in the Third Reich. 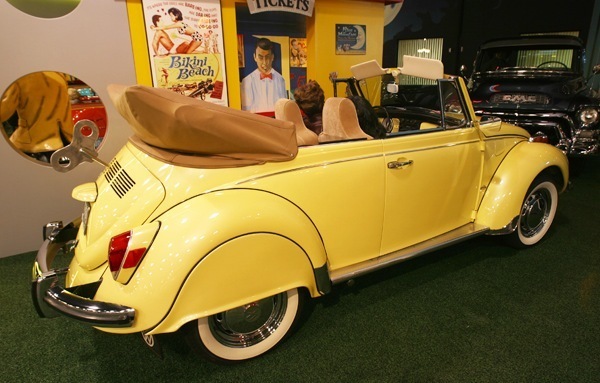 It was later known as the Type 1, but became more commonly known as the Beetle after World War II. Prototypes appeared from 1931 onwards; the first prototypes were produced by Zundapp in Nurnberg, Germany, the Porsche Type 12. Next prototype series (Porsche Typ 32) was built in 1933 by NSU, another motorcycle company. In October 1935 the first Type 60 was ready. 1935 the testing of the “V 3” started. The “VW30” Prototypes awaited further testing in 1937. 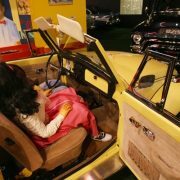 All cars already had the distinctive round shape and the air-cooled, rear-mounted engine, except for the Type 12, Zundapp preferred a 5-cylinder radial watercooled engine. The factory had only produced a handful of cars by the time war started in 1939. Consequently, the first volume-produced versions of the car’s chassis were military vehicles, the Kubelwagen Typ 82 (approx. 52,000 built) and the amphibious Schwimmwagen Typ 166 (approx. 14,000 built). The car was designed to be as simple as possible mechanically, so that there was less to go wrong; the aircooled 985 cc 25 horsepower (19 kW) motors proved especially effective in actions of the German Afrika Korps in Africa’s desert heat. This was due to the built-in oil-cooler, and the superior performance of the flat-4 engine configuration. The innovative suspension design used compact torsion bars instead of coil or leaf springs. The city of Stadt des KdF-Wagens was created in Lower Saxony in 1938 for the benefit of the workers at the factory. A handful of civilian-specific Beetles were produced, primarily for the Nazi elite, in the years 1940-1945, but production figures were small. In response to gasoline shortages, a few wartime “Holzbrenner” Beetles were fueled by wood pyrolysis gas producers under the hood. In addition to the Kubelwagen, Schwimmwagen, and handful of others, the factory managed another wartime vehicle: the Kommandeurwagen; a Beetle body mounted on the Kubelwagen chassis. A total of 669 Kommandeurwagens were produced until 1945, when all production was halted due to heavy damage sustained in Allied air raids on the factory. Much of the essential equipment had already been moved to underground bunkers for protection, allowing production to resume quickly once hostilities had ended. In occupied Germany, the Allies followed the Morgenthau plan to remove all German war potential by complete or partial pastoralization. As part of this, in the Industrial plans for Germany, the rules for which industry Germany was to be allowed to retain were set out. German car production was set at a maximum of 10% of the 1936 car production numbers. The re-opening of the factory is largely accredited to British Army officer Major Ivan Hirst (1916-2000). Hirst was ordered to take control of the heavily bombed factory, which the Americans had captured. His first task was to remove an unexploded bomb which had fallen through the roof and lodged itself between some pieces of irreplaceable production equipment; if the bomb had exploded, the Beetle’s fate would have been sealed. Hirst persuaded the British military to order 20,000 of the cars, and by 1946 the factory was producing 1,000 cars a month. During this period the car and its town changed their Nazi-era names to Volkswagen (people’s car) and Wolfsburg, respectively. 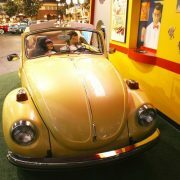 The first 1,785 Beetles were made in a factory near Wolfsburg in 1945. Following the Army-led restart of production, Heinz Nordhoff was appointed director of the Volkswagen factory, under whom production increased dramatically over the following decade, with the one-millionth car coming off the assembly line by 1955. 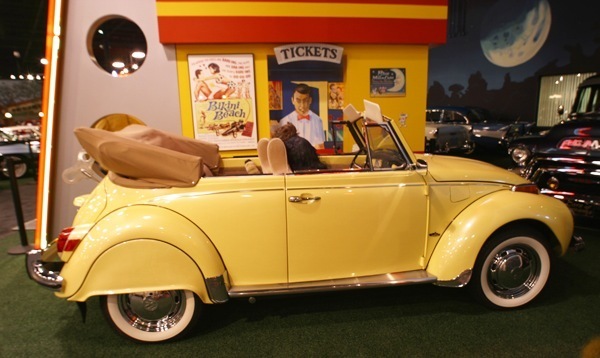 During this Post-war period, the Beetle had superior performance in its category with a top speed of 115 km/h (71 mph) and 0-100 km/h (0-60 mph) in 27.5 seconds on 7.6 l/100 km (31mpg) for the standard 25 kilowatts (34 hp) engine. This was far superior to the Citroen 2CV and Morris Minor, and even competitive with more modern small cars like the Mini of the 1960s and later. The engine fired up immediately without a choke. It had tolerable road-handling and was economical to maintain. Although a small car, the engine has great elasticity and gave the feeling of better output than its small nominal size. However, the opinion of people in the United States was not as flattering due to the characteristic differences between the American car market and European car market at the time. Henry Ford II once described the car as ‘A little box’. 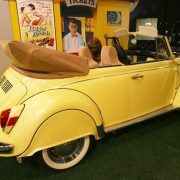 During the 1950s, the car was modified progressively: the obvious visual changes mostly concerned the windows. 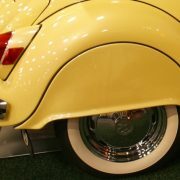 In March 1953, the small oval two piece rear window was replaced by a slightly larger single piece oval rear window. More dramatically, in August 1957 a much larger full width rear window replaced the oval one. 1964 saw the introduction of a widened cover for the light over the rear licence plate. Towards the end of 1964, the height of the side windows and windscreen was slightly increased giving the cabin a less pinched look: this coincided with the introduction of a very slightly curved windscreen, though the curve was barely noticeable. 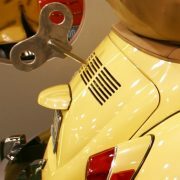 The same body appeared during 1966, with a 1300 cc engine in place of the 1200 cc engine: it was only in the 1973 model Super Beetle that the beetle acquired an obviously curved windscreen. 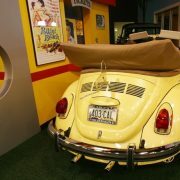 The flat windshield remained on the standard beetle. During the 1960s and early 1970s, innovative advertising campaigns and a reputation for reliability and sturdiness helped production figures to surpass the levels of the previous record holder, the Ford Model T, when Beetle No. 15,007,034 was produced on 17 February 1972. By 1973, total production was over 16 million, and by 23 June 1992, there had been over 21 million produced. The Beetle is the world’s best-selling car design; though more units of the Toyota Corolla brand have been sold, there have been many total redesigns of the Corolla, each amounting to a new car design with the same name. 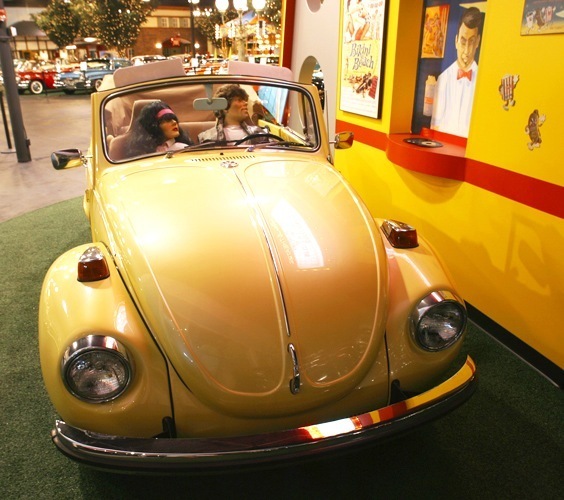 The Volkswagen Beetle underwent significant changes for the 1967 model. While the car appeared similar to earlier models, much of the drivetrain was noticeably upgraded. 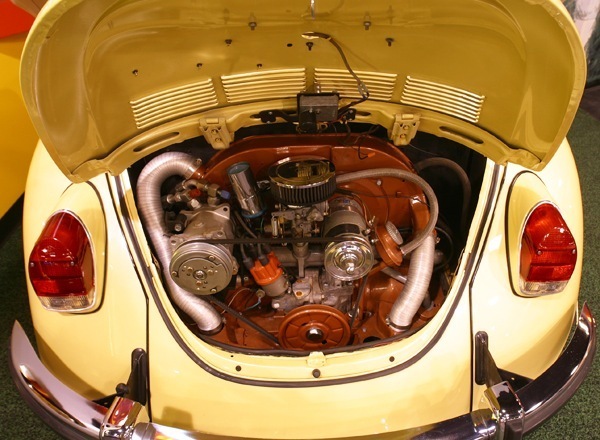 Some of the changes to the Beetle included a bigger engine for the second year in a row. Horsepower had been increased to 37 kilowatts (50 hp) the previous year, and for 1967 it was increased even more, to 40 kilowatts (54 hp). On US models, the output of the electrical generator was increased from 180 to 360 watts, and upgraded from a 6-volt to a 12-volt system. The clutch disc also increased in size, and changes were made to the flywheel, braking system, and rear axle. 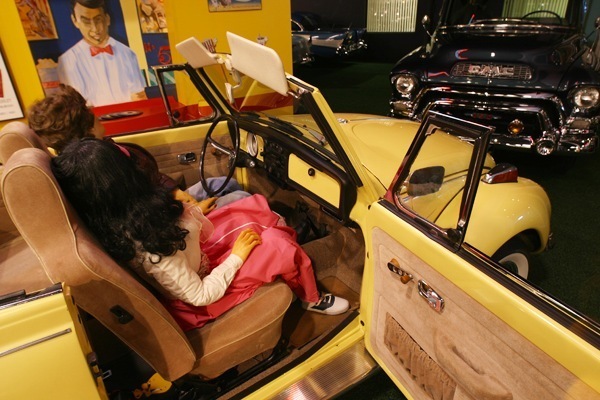 New standard equipment included two-speed windscreen wipers, reversing lights, a driver’s armrest on the door, locking buttons on the doors, sealed-beam headlights, and a driver’s side exterior mirror. 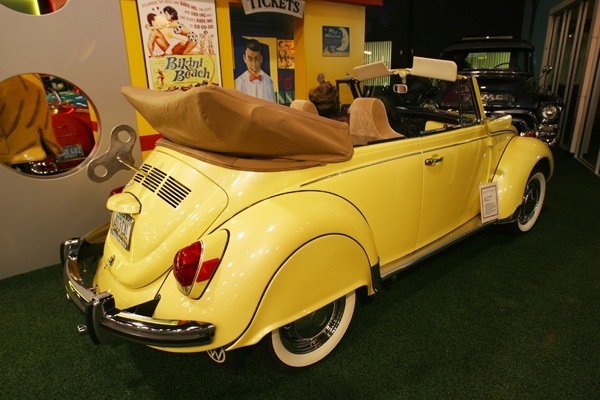 In February 1967, inventor Don P. Dixon of San Antonio, Texas filed and was ultimately granted a patent for the first air conditioning unit specifically designed for the Beetle, which were soon offered by US dealerships. The 1967 model weighed 840 kg (1852 lb), which was a typical weight for a European car at this time. Top speed was 130 km/h (81 mph). In 1971, while production of the “standard” Beetle continued, a Type 1 variant called the Super Beetle, produced from model year 1971 to 1979 (1302s from 1971 to 1972, and 1303s from 1973 onwards), offered MacPherson strut front suspension, which required a significant redesign of the front end. This resulted not only in a better turning radius (despite having a 20 mm (3/4 in) longer wheelbase), but because of the replacement of the bulky dual parallel torsion bar beams which had intruded upward into a large area within the trunk, and the stretched “nose” of the vehicle which permitted the relocation of the spare tire from a near vertical to a low horizontal position, this opened up approximately double the usable luggage space in the front compartment. Air pressure was used from the spare tire to pressurize the windshield washer canister, as an electric pump was not used to deploy windshield washer fluid for windshield cleaning. 1972 Super Beetles had a slightly larger rear window, larger front brakes, and four rows of vents (versus two rows previously) on the engine deck lid. The tail lights now incorporated reversing lights. 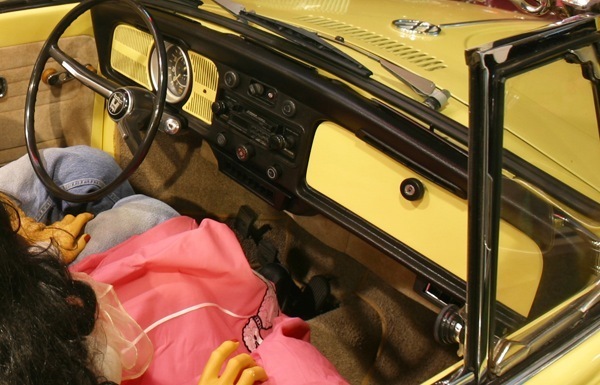 The “four spoke” steering wheel and steering column were re-engineered to the “energy absorbing” design for better crash safety. A socket for the VW Dealer Diagnosis was fitted inside the engine compartment. In 1973, the introduction of a more aerodynamically curved windscreen pushed it forward and away from the passengers, purportedly due to US Department of Transportation safety requirements. 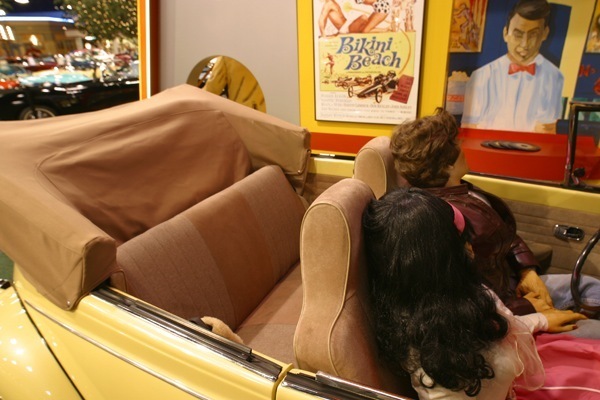 This allowed for a redesigned, “padded” dashboard (all pre-73 Beetles had virtually no horizontal dash area). 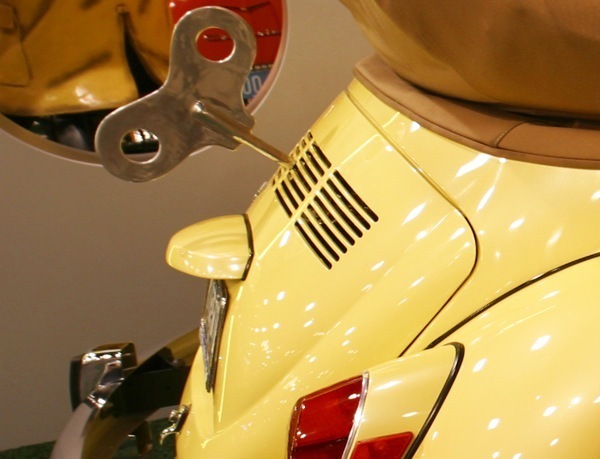 A 2-speed heater fan, higher rear mudguards, and larger tail lights (nicknamed ‘elephant’s feet’) were added. 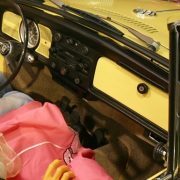 The changes to the heater/windshield wiper housing and curved windshield resulted in slight redesign of the front hood, making the 1971 and 1972 Super Beetle hoods unique. For 1974 the previous flat steel bumper mounting brackets were replaced with tubular “self restoring energy absorbing” attachments, effectively shock absorbers for the bumpers. The steering knuckle and consequently the lower attach point of the strut was redesigned to improve handling and stability in the event of a tire blowout. This makes the struts from pre-74 Supers not interchangeable with 1974-79 makes. 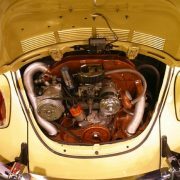 1975 brought the replacement of carburetors with Air Flow Control (AFC) Fuel Injection on U. S. and Canadian Beetles, a derivative of the more complex Bosch fuel injection system used in the Volkswagen Type III. The fuel injected engine also received a new muffler and the option of an upstream catalytic converter required on some models (e.g. 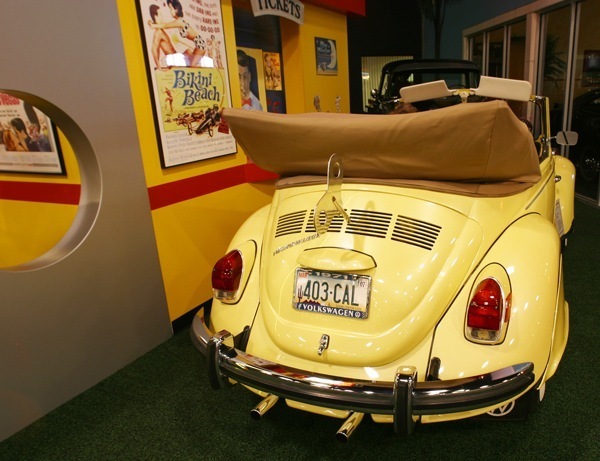 California), necessitating a bulge in the rear apron sheet metal directly under the rear bumper, and replacing the distinctive dual “pea shooter” pipes with a single offset tailpipe, all of which make the fuel injected models easy to identify at a glance. Other changes were rack and pinion steering vs. the traditional worm and roller gearbox, and a larger license plate lamp housing below the engine lid. 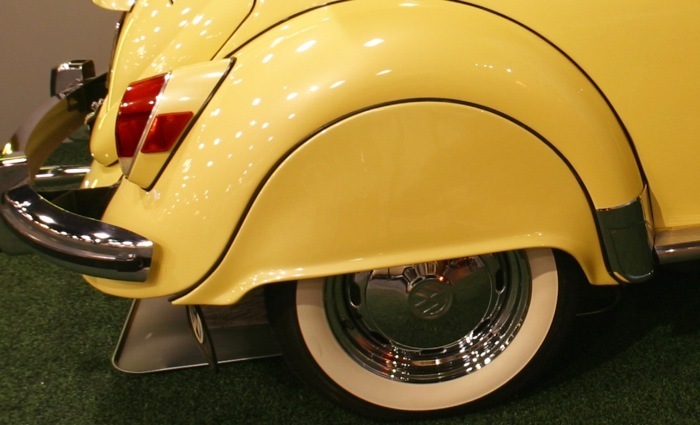 The front turn indicators were moved from the top of the fenders into the bumper bars on European models, a portend of the “Euro look” style years later by Beetle restorers. In 1976, the hard top Super Beetle and 1300 were discontinued (though convertibles remained Super Beetles through 1979) and replaced with an ‘improved’ standard Beetle with 1600 cc engine, independent rear suspension, front disc brakes, blinkers in the front bumpers, elephant’s foot tail lights and rubber inserts in the bumper bars. The “Auto-stick” transmission was dropped. 1976-on Super Beetles saw no significant engineering changes, only a few cosmetic touches and new paint options, including the “Champagne Edition” models (white on white was one example) to the final 1979 “Epilogue Edition” black on black, in salute to the first Beetles produced in the 1930s.